Today I wanted to share a little about teaching handwriting. You don’t have to purchase a separate handwriting workbook. You can just make your own worksheets or print some worksheets out using free handwriting worksheet generators. I used a formal writing program with my daughter, oh so many years ago. But now I am teaching a little wiggly boy who doesn’t really care for workbooks at all. So I try to make learning for him as fun as I can. He doesn’t like to write much so I like to make sure we are working on more than one subject at a time when we do table work. So when we are practicing his words to read for the day I just write them in highlighter pen on a plain piece of paper and have him trace them. I also add a little x so he will know where to start to form each letter. At first I needed to really watch him to make sure he went the right direction, but now he does fairly well on his own. I am always next to him to keep an eye out for reversals, as they can be hard to correct. I like making my own handwriting sheets because the child can practice words they are learning to read. Which helps to reinforce their reading skills too. But if you don’t want to write your own sheets by hand, but you want some custom worksheets to match what your child is reading I have a few free resource suggestions. Hand Writing Worksheet lets you pick the words to input, you can choose single words, multiple words, sentences and paragraphs for kids to copy. You can vary the size of the font and pick from print, cursive and D’Nealian styles. Then just print your worksheet. A to Z Teacher Stuff Tools has a worksheet generator you can enter up to 17 characters and choose from traditional or modern printing. You can include instructions for the student too. This generator makes the first line printed as an example of how the students completed work should look. Then each line after that has the words dotted for the student to use as a guide. Multiple words can be used and sentences but there wasn’t a paragraph option on this one. Handwriting for Kids generator lets you print worksheets with a title of your own choosing. You can list up to eight different lines for the kids to write. There is one option the style of handwriting, which is print. I didn’t see any starting points indicated on the worksheet. There is the option of having the dashed words all the way a crossed the paper or just one or two examples and then the child can complete the line on their own. Handwriting Practice has a generator that you can customize the font size. You can choose between print, cursive and D’Nealian styles. You can choose letter size, letter color and line color too. There is also an option to choose hollow letters for the student to stay inside of or the dotted guide. You get to choose between sentence practice or paragraph practice. There is also an option to include directional arrows, trace letters, start dots only or a blank line. You can vary these options line by line. Then just print or you can make an account and save the worksheet. If your child loves technology here’s a few apps we have use for helping with handwriting. 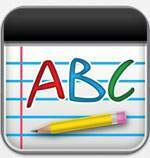 ABC Letter Tracing is another app that my son uses. This app is simple in that the child picks the letter to trace and on the screen a dotted outline of the capital and lowercase letters are there to trace. This app is free. Here’s a couple of free apps that you might like to try too. We don’t have any of these but they did look like good ones. 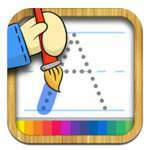 Little Writer – The Tracing App for Kids this app lets your kids practice upper and lowercase letters, numbers and words. This app is free. There is also a Little Writer PRO for $1.99, which has a few more features. 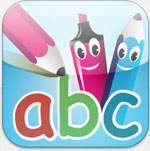 Learn the Alphabet – ABC Tracing this app lets your kids trace letter and numbers and has a doodle pad and a matching game too. This app is free. 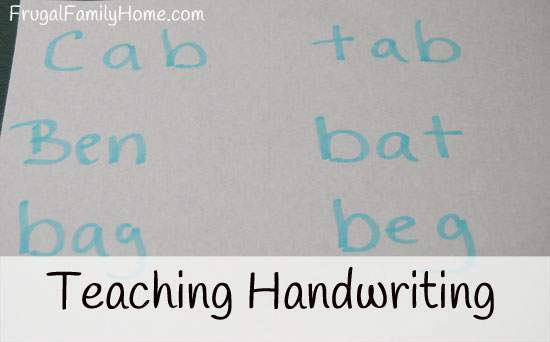 Do you think you will make your own handwriting sheets for your kids to use? I have an 11 yr old boy that will do any assignment I put in front of him with zero complaints. He will work just as fast as he can so his day is done. Then I have a 9 yr old boy that’s a lefty and hates to write (unless it’s a story he’s working on! I let that happen whenever he wants!) Hates to really sit down to do any schoolwork but math. LOL! You listed some AWESOME free resources! I wish more of them used Italic/Italic Cursive. For my daughter we used Getty-Dubai Italic and Italic Cursive, she really liked to do handwriting. With my son I’m just happy if he forms his letters correctly and does a neat job. I have looked into the StartWrite program a few times and it looks great. It’s wonderful you were able to get such a great deal on it. Yes, it would be great if there were more resources for Italic handwriting as it seems to be really popular. Thank you for sharing your experience and all of these resources, Shelly! I’ve pinned your post so that I can remember it and come back to it. My husband is currently working on handwriting with my two younger boys. My 6 year old is doing a good job, but my four year old is struggling a bit with just how to even hold a pencil.